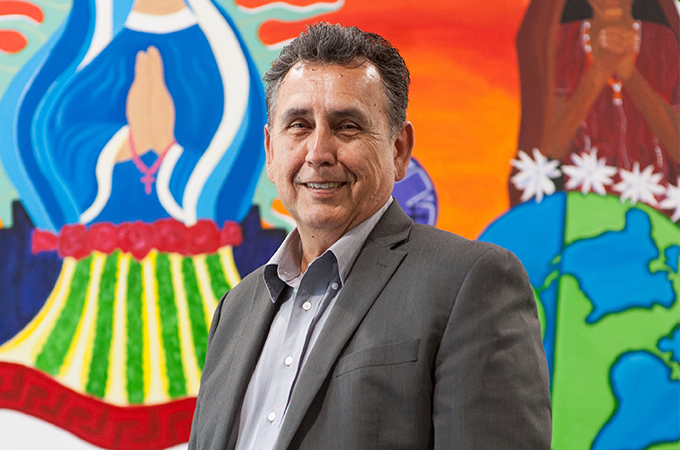 Jesús Treviño, Ph.D., recently arrived at the University of Redlands as a consultant and interim director of University-wide inclusiveness and community, charged with submitting recommendations for a University strategic plan for diversity and inclusion efforts across campus. Mika Elizabeth Ono and Katie Olson of U of R’s Bulldog Blog sat down with Treviño to talk about his professional experience and how his expertise might benefit the campus community. Bulldog Blog: Can you tell us a little about your professional background? Jesús Treviño: I've done diversity work at several different institutions. My most recent appointment was at the University of Arizona as the senior diversity officer. I have also worked at small, private universities—such as Southern Methodist University in Dallas and the University of Denver—some universities with medical schools, and two research institutions. Over the years, as a result of meeting with different campus communities, I began to learn a lot and think about the similarities and differences in terms of issues they face. BB: What does a diversity consultant do? JT: Diversity officers and consultants have to know a little bit about a lot. I have a very eclectic academic background—I started out as an art major and then switched to social work with an emphasis on community organizing, which actually helps me when I come to a campus and organize all the groups that are critical to diversity as well as to the entire campus. Then I received a master’s in language and international trade, which involved core courses for an MBA, which again expanded my mind into a totally different realm. After that, I received master’s and doctoral degrees in higher education at UCLA. So, as a consultant, I bring all of that with me. The work I do educating people about issues of diversity is primarily through storytelling, metaphors, and examples. At Redlands, ultimately, I will put a report together with recommendations as to how I think the University should be handling issues of diversity and inclusion. BB: How long will you be on campus? JT: Until I finish and deliver the report on February 15. BB: What are your plans? JT: My job here is to listen to a lot of individuals about the status of diversity and inclusion, not only with the Center for Diversity and Inclusion, but across the campus. In addition to my many meetings and appointments, I want to set up focus groups. I’m also depending on members of the community to invite me in and say they want to talk to me. I’ll be taking a look at the structure of Campus Diversity and Inclusion (CDI). There seems to be a consensus that people want diversity and inclusion addressed systemically across the University. I’ll also work to put together a job description for a type of chief diversity officer effective at collaborative leadership and appropriate for the University of Redlands. At other universities, I’ve written campus climate reports, advised on diversity in the classroom, conducted trainings on conflict de-escalation, and so on. People on campus can schedule trainings with me while I’m here. I want to actively engage with people around these issues, because it’s not enough to just deliver a report. I’m also happy to provide advice on specific situations. Take advantage of me as a resource! BB: What are some of the challenges of being a diversity consultant? JT: We all have barriers in our minds that prevent us from understanding others from diverse groups, depending on which groups we belong to. For example, males often don't think about the daily challenging experiences of those who identify as women, such as how women experience safety. These barriers have real-world consequences. Take, for instance, a case of women on a college campus asking a male administrator for funds for more lighting because there's a section of the university that is not well-lit; that administrator is not necessarily going to see the problem because he may never have experienced it himself. The challenge is that understanding others is an ongoing project. Hopefully, we can find a diversity officer who is going to be engaged and committed to dismantling these kinds of mental barriers. BB: What are some best practices in the field around diversity and inclusion? JT: One effective practice is creating a two-pronged model. On the one hand, an intergroup relations center can address issues of campus climate, coalition building, and engaging everybody around capacity building and understanding diversity. On the other hand, a multicultural center can support underrepresented communities, such as Native Americans, and other distinct groups and offer support and cultural programming. These two models are viable efforts and exist on other college campuses. Also, a diversity plan has to include accountability and positive changes to the university’s infrastructure. As an example, some universities ask on their hiring application forms how the candidate plans to contribute to the diversity of the institution. Others review who is being included and who is being left out when evaluating proposals for new academic programs. Many pieces come together to create a climate where inclusive excellence becomes a habit.